Rich and Carol Lillard manage their 0.75 acre property in the suburb of Lakewood without any help. Rich mows the lawn; Carol takes care of the design, digging, planting, weeding, and pruning. 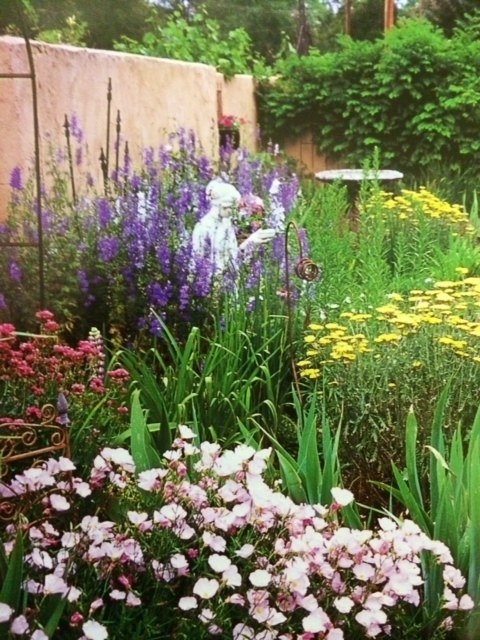 Carol’s knowledge of gardening, her artistic eye, and–above all–her devotion to the garden are what make it so special. Her restrained good taste in her selection of ornaments–birdbaths, benches, containers, plaques, window boxes, statues, and fountains–all contribute to the peaceful atmosphere. 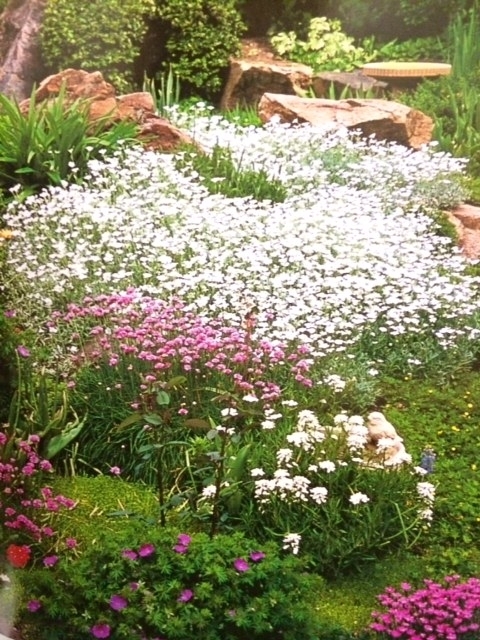 Carol relies on groundcovers to keep the weeds at bay: purple creeping veronica, blue-hued thyme, sedum, phlox subulata, white snow-in-summer and basket-of-gold. 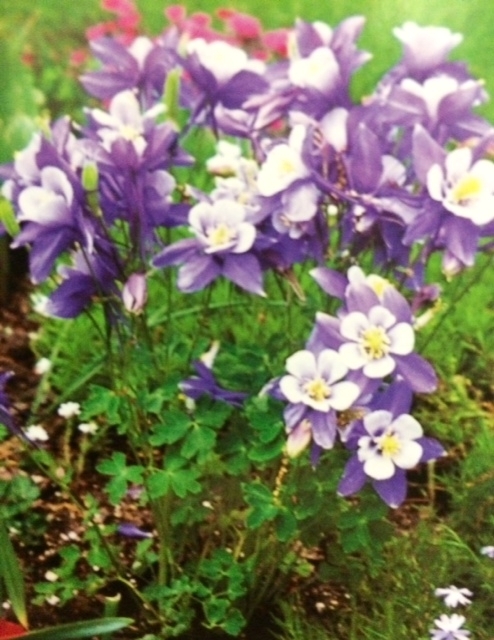 In spring, splashes of color appear; tulips, daffodils, white candytuft, and purple grape hyacinth. 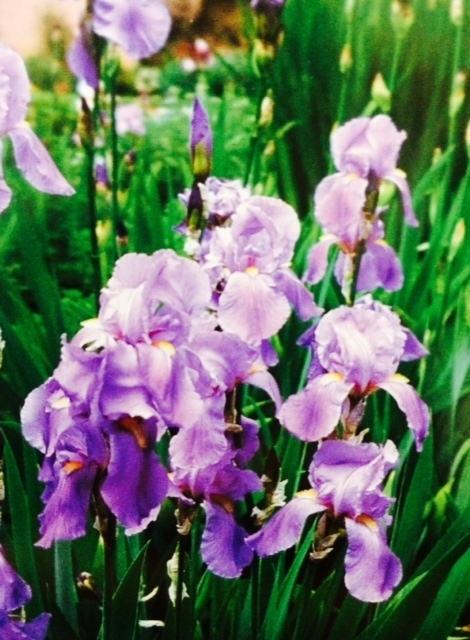 These are followed by waves of irises, peonies, yarrow, larkspur, garden phlox, and asters. 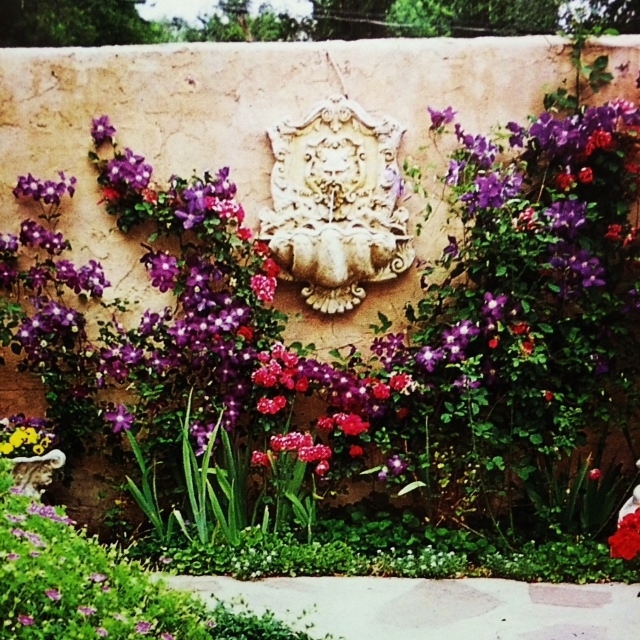 Trained against the pale-hued wall, a spectacular combination of glorious red climbing roses and purple clematis form a pattern around a wall fountain. 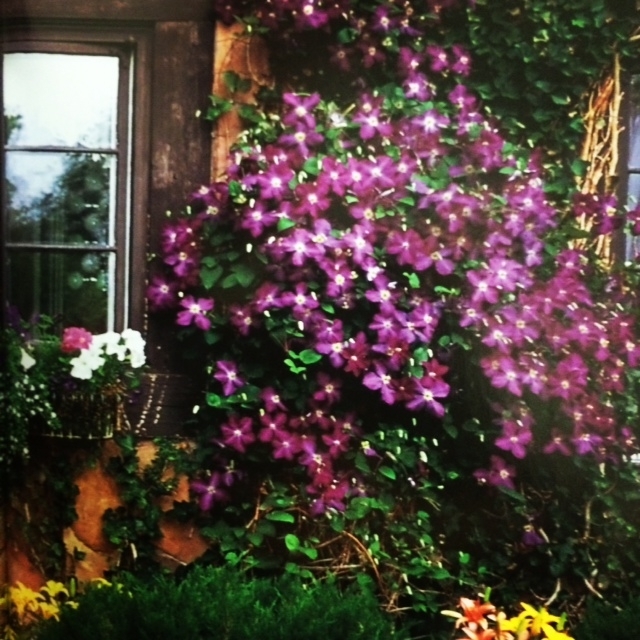 Two equally stunning clematis “Jackmanii” planted against the wall of the house clamber to a height of 15 feet! 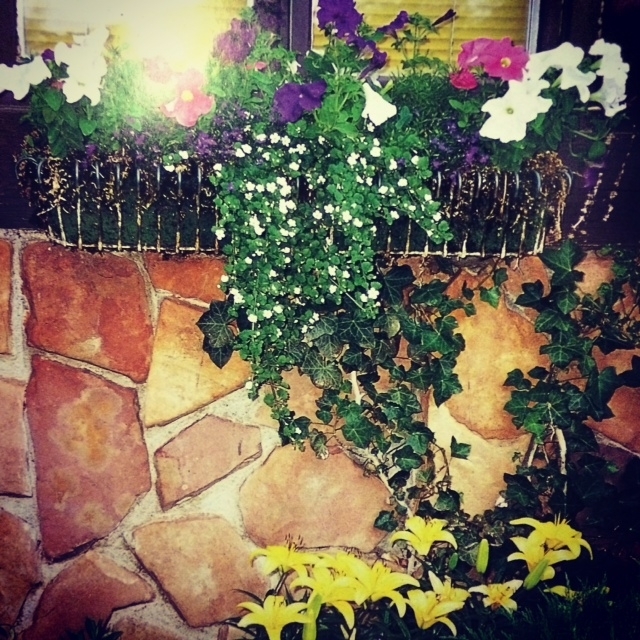 Window boxes ablaze with impatiens, petunias, and lobelia are positioned in between these purple beauties. Carol’s sensibilities are evident in her design, color combinations, and flair in choosing just the right weathered ornaments to stage her tableaux. 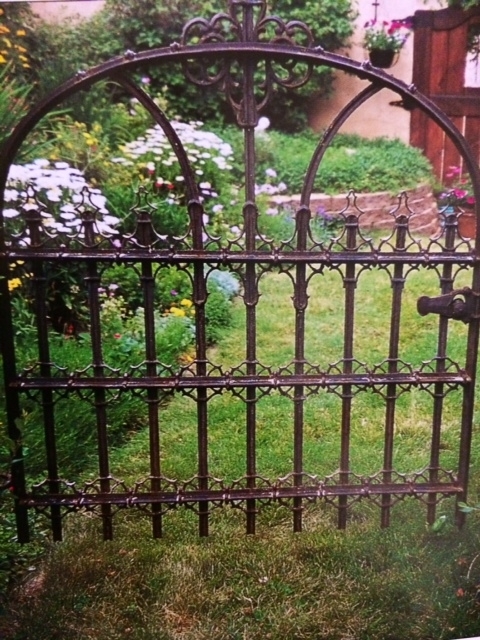 If you had unlimited funds (and time) to spend on your garden, what would it look like? Daydream away in the comments below! Snow in summer blossoming in spring. How would you like to look out your window and see this sight? A traditional stone statue provides a classical touch. 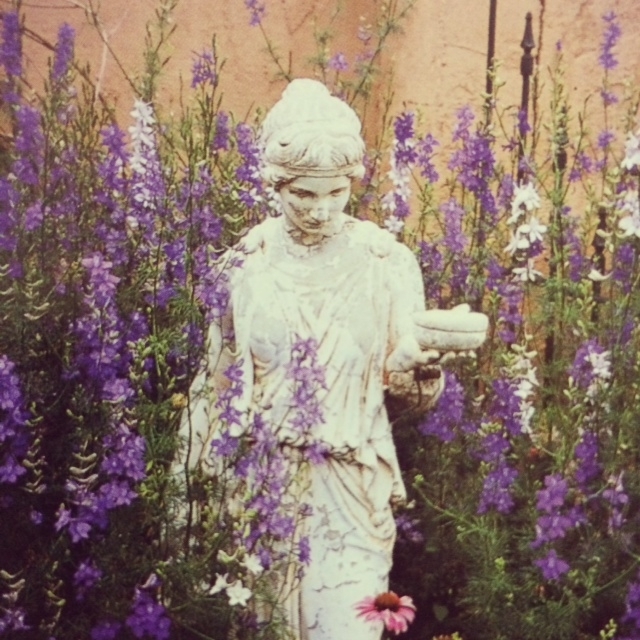 A landscape shot of the same statue surrounded by lovely flowers. The pale-hued wall fountain that provides the perfect canvas for colorful flowers. 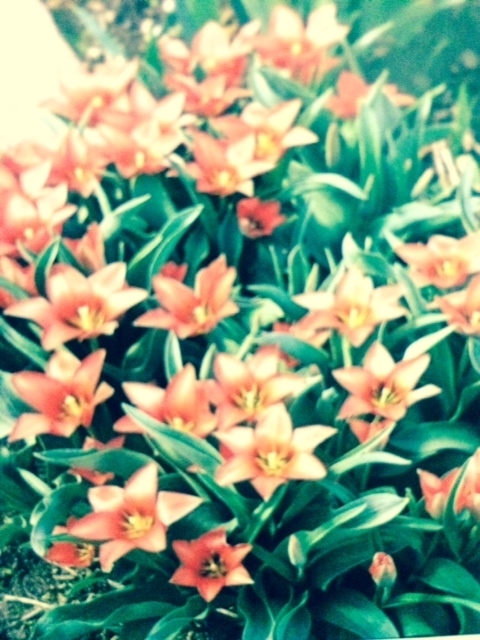 What would you plant in your window box?